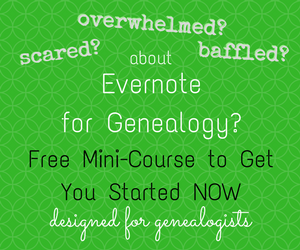 Have you discovered there's a lot you need to learn about genealogy? I have heard that sentiment so many times from readers, lately. So, in this post I want to show you an easy way to keep your (overwhelming amount of) genealogy education sources organized. If you're reading this, I'm guessing you read a lot of online material (that's the education sources I'm referring to). Maybe you read a lot of blog posts. Pinterest is the perfect tool for organizing blog posts or web pages (as well as being a way to find new information). This hasn't always been the case but recently they rolled out "sections" for boards. I think that's the tool that will make Pinterest a power tool for organizing educational material. Think about it, Pinterest is designed to "pin" ideas to a board (if you don't know, it's supposed to be like a digital cork board). Those ideas have to have an image because it was originally envisioned like a cork board, where you'd get inspiration from looking at what you pinned. But Bloggers and companies have embraced the concept and now Pinterest is considered a search engine. However, you're still organizing your Pins, not just saving them like you would if you saved a link, bookmark, or printed a webpage (all of those require an extra step, or five, to organize. Pinterest forces you to at least pick a board so it's your fault if you Pin everything to one unorganized board). If you like cooking, crafts, or fashion and you're not on Pinterest, I really recommend checking it out. If you like reading information online (especially if you like saving information you find online) you should consider it. I started with Pinterest because I'm a crafter. I am now totally that person that heads straight to Pinterest when I need a recipe. I can't tell you how helpful it is when you need ideas for school-related projects. But genealogy? I'll be honest, to me, not a natural place to find genealogy. But apparently, I'm in the minority. No matter what I do, this blog gets at least 70% of its (growing) traffic from Pinterest. That doesn't count all my newsletter readers that go to a new post when they learn about it from the newsletter, but found the blog from Pinterest, originally. In other words, I'm probably preaching to the choir. 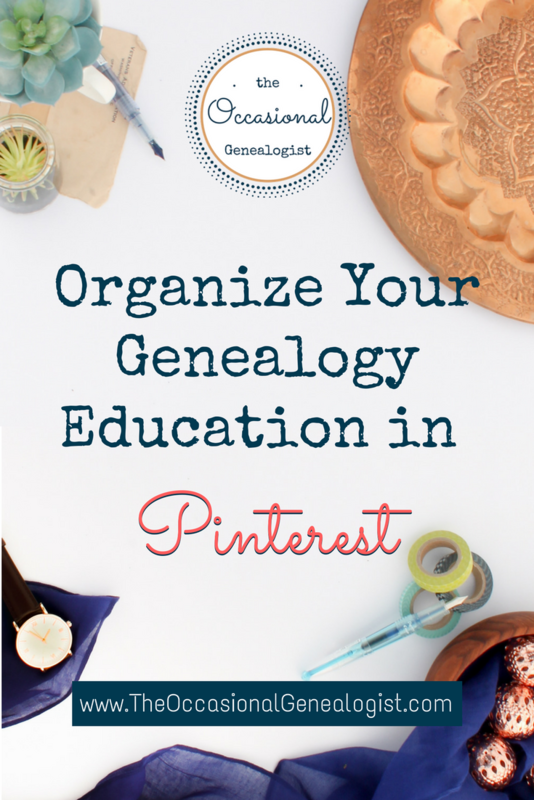 So let's stop talking about what Pinterest is or whether you should use it and talk about genealogy education. I am 100% behind self-education in genealogy. I had been doing genealogy for almost 15 years before I ever attended a genealogy meeting or took an in-person course. That was in the days before you could do serious online research! I started with how-to books from the library and then really got going when I had a high-speed Internet connection in college. How-to genealogy information on the Internet has been around a lot longer than document images. But I also love education that involves an instructor (whether in-person or online). I think I've used every type of education except a correspondence course or extended online course (and that's more because of timing---when those were options in my genealogy journey they didn't fit my budget or availability). Why am I telling you this? You need genealogy education if you want to be successful at genealogy. 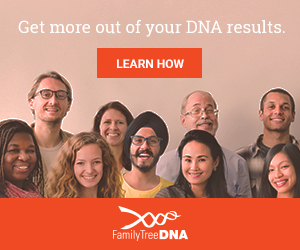 What Does Genealogy Success Look Like? Being successful at genealogy means identifying the people you intend to find, in an efficient manner. That means not going down the wrong family line because you confused two people of the same name (or just totally misidentified a parent). It means not getting stuck for an inappropriately long time. Sometimes you will be stuck for a long time because the information you need is so hard to get. 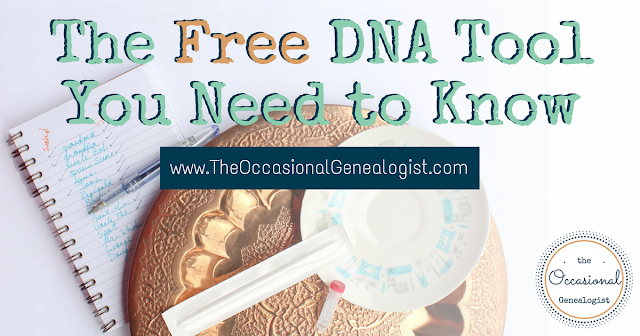 Many amateur genealogists get stuck because they don't bother learning a basic genealogy skill that would reveal that they've already found the answer they seek. 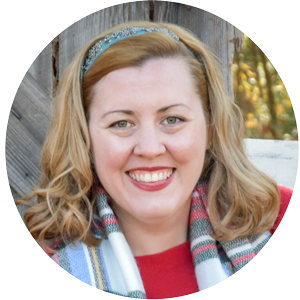 Many amateur genealogists get stuck because they don't bother learning a basic genealogy skill that would reveal that they've already found the answer they seek. Genealogy education is vital. You weren't born with the skill set to do genealogy. You have to learn it (think about it, you had to learn something when you got started). The farther back in time you go, the less information you will know. Words have different meanings, laws are different, normal behavior is different. Everything is different. Sure people are always people, but you have to discover that through things that are different---different words, laws, records. You have to get educated. So let's put all this together. You need genealogy education. It's actually way too much education to get all at once. That means you have to get organized if you want to learn what you need, when you need it. Enter Pinterest and their boards with sections. What Can You Organize with Pinterest? You can learn a lot from online material. Not everything, but a lot. Why not create a board or boards on Pinterest to categorize material you want to read later? One reason I love this idea is it makes what you saved easily accessible from any device. Pinterest is easy to use on a small smartphone or a large desktop computer. You won't be trying to click on insanely tiny links, even. The great thing is, you can save anything you find on the Internet to Pinterest. Sure, most things, especially in genealogy, won't have a pretty image. For your personal use, who cares? That means you can organize ALL your education ideas. I've mentioned web pages/blogs with information. You can save ideas of books to read from Amazon or a library catalog (why not use WorldCat to find items beyond your local system?). You can save ideas of periodicals that exist, even if a digital version isn't available. You can save online or in-person courses you want to take when the budget allows. All you need is a webpage that tells you about the education option you want to save. This is exactly like saving links or bookmarks but with a built-in organization system and the ability to automatically access everything from any device. I would never save the number of links or bookmarks equivalent to the Pins I've saved. It would be overwhelming. If you don't want to use Pinterest, you could adapt this to Evernote. I wrote a post about organizing your Pins in Evernote so you can incorporate the titles of your Pins (with a link) into your Evernote searches. So let's talk about the organizational options using boards and sections (you can adapt this to other systems if you aren't using Pinterest). If I were a young genealogist needing lots of topics, I would create several boards to keep everything manageable. One board with many sections will still be a bit overwhelming. You don't want too many boards, though (unless your account is mainly genealogy). Remember, I've said how easy this makes accessing posts to read. So imagine you're waiting somewhere and you want to spend the time reading a genealogy post/article. Create boards so this will be easy. This should be based on how you use Pinterest (if you have 20 crochet boards plus other topics, it's gonna take time to scroll to your genealogy boards. You probably don't' want 20 of them, too). I run into a problem describing hypothetical options because I only do U.S. research. I don't need to learn about German research, and Scandinavian research, and... Keep that in mind if you need more distinct topics than I describe (but do you really need a German board? Maybe a European board---but do what works for you). I would create a board for genealogy topics (as in a board like "Core Genealogy Education"), one for specialty topics (for example "foreign research" or "colonial research" or whatever is appropriate for you), one for courses or "paid" education, and one for education tools (books or anything that doesn't fit in the other boards). You could also include books, etc. with other genealogy tools, i.e. things you buy that aren't courses. Within the boards, you then use sections to keep things organized. You can leave pins out of a section so don't create a section that will have one pin in it, that won't help. There's one issue, you can not put one pin in multiple sections. You can pin the pin (again) to a different section. My solution, I'd try to keep my sections fairly broad. Remember, too many pins become more difficult to use and the point is to use them. Keeping boards lean and easy to use is why I'd have courses in a separate board (probably without sections but you might think of sections you'd use). Most in-person options cover different topics. I'd rather just keep all of these on a board (or maybe I'd have a section for week-long institutes, a section for conferences, a section for online courses...). Since courses usually cost money, this would sort of be sorting them by cost. If I need to learn about a topic, I might be able to spend up to the most expensive option I've Pinned. More likely, I don't have money for more than a short-term online course. But I might want to plan for a more expensive option which means I'd want to review my options by "price." For me, I need to learn the more expensive options exist. I might review my education options and eventually, I will REALLY want to attend a specific expensive option. It will be a goal (I won't need to be reminded by my Pin anymore). If you want to keep courses organized by topic, do it. I'd still keep anything you can't/don't access while waiting, in a board separate from reading you could do while waiting (or whenever you have time to read a post). Note that you can search your own boards but the search terms have to appear in the text. So type something in that is meaningful to you, when you save the Pin. Some Pins have a second set of text provided by the website creator, but not all (there are lots that don't in genealogy). When you save a Pin, type something in that is meaningful to you so it will be searchable! If you Pin an institute because it offers a German course, mention that in the text and you can find it by searching your pins for "German," regardless of your boards and sections. I don't know how clear these instructions are. I use Pinterest so much, to me, it makes sense. But if you don't use Pinterest that much, I can't be sure. So I've created some sample boards on The Occasional Genealogist Pinterest account. Specifically, I'm creating an "Online Reading" board, a "Beyond Online Reading" board for anything like a class (online, offline, one-hour to months, free, and paid), and "Resources" which are books, periodicals, or anything that isn't available for free online and doesn't belong in the first two boards. I may create another board for specific topics so just see what you find on my account. I will add to these over time and adjust and tweak as the Pins seem to need. Note that I don't plan to use sections on my boards EXCEPT on these samples. In other words, only these samples will be an example of what I'm suggesting. As I mentioned, I only do US research so you can use the sample boards as inspiration or as a starting point for your own education boards. I will only be pinning content I think fits the education topics I've created and that I'm familiar with (i.e. not advanced, non-U.S. research). The sample boards are all about quality education material. I am starting them from a mix of my own posts and web pages/blogs I might not normally pin because there are no images (i.e. sources I've used or am familiar with and you are less likely to find if you start your own boards via Pinterest instead of an Internet search). I'll add in some of my favorite pins from other bloggers (i.e. with pretty images) over time. I don't want you to think the exclusion of other bloggers is because of their content, I'm starting with what I know best. Let me know what questions you have about this post. I don't normally explain how to use Pinterest so if it's not clear, let me know. 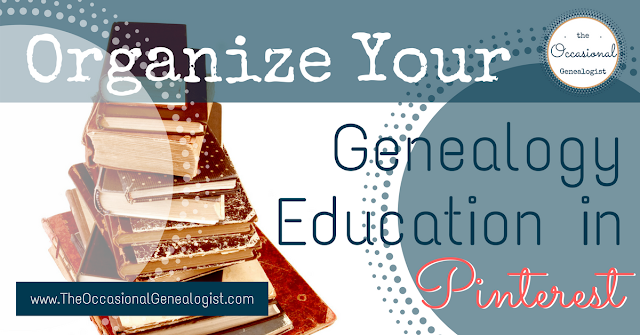 I really think this is a great idea for organizing genealogy education, even if you only ever organize blog posts!